I should also make special mention of the range of 2013 wines that I tasted from Rhys Vineyards for this article, as this is very clearly a watershed vintage for this first class estate and readers should make a very special effort to latch onto some of these 2013s before they vanish from the market. 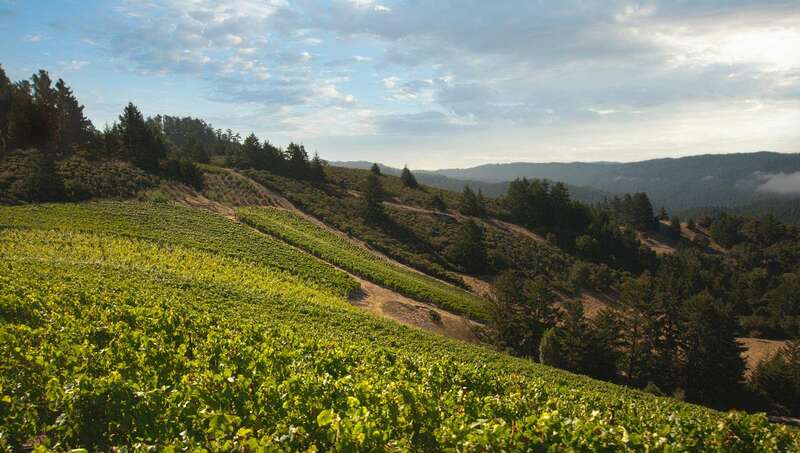 By this time, Kevin Harvey’s Rhys Vineyards is synonymous with excellent, terroir-defined examples of chardonnay, pinot noir and syrah, and for many lovers of soil-driven American wines, Rhys is at the very summit of what is possible in California today. However, get ready for the 2013s, as with the release of this vintage, Kevin and his extremely talented team at Rhys have taken things to a new level of quality, with simply stunning wines that lay down the gauntlet not only to the very best pinot and chardonnay producers in the states, but would not be out of place in the very rarefied air of the greatest wines from Burgundy. This is just a very, very special vintage at Rhys! To commemorate the stunning quality of 2013, Rhys has made its first “reserve bottlings” from two of its top vineyards- Alpine and Horseshoe, which are labeled as “Hillside” cuvées and denoted by special black labels. As Kevin Harvey notes, “we view these bottlings as a bit like a Champagne vintage declaration- in the old days!” and “we are only going to bottle them when 1) we feel the quality merits it; 2) we have sufficient quantities; and 3) there is a marked difference with the “regular” bottling.” They are made from a selection of the best parcels in each vineyard, but raised the same as the regular cuvée from each parcel and Kevin expects to produce these three or, at most, four times per decade. The 2013 Alder Springs Vineyard Chardonnay from Alesia is outstanding and one of the best wines I have yet tasted from this second label from Kevin Harvey’s excellent team at Rhys Vineyards. The lovely nose wafts from the glass in a cool and classy blend of fresh pineapple, pear, salty soil tones, acacia blossoms and a stylish base of butter oak. On the palate the wine is deep, full-bodied and beautifully balanced, with fine complexity, crisp acids and fine length and grip on the poised and very serious finish. At 13.1 percent alcohol, this has really hit its sweet spot and sings on both the nose and palate! Truly a superb bottle of chardonnay. 2015-2020+. 92. The 2013 Horseshoe Vineyard chardonnay from Rhys Vineyards is a beautiful young wine, wafting from the glass in a still primary constellation of apple, buttered almonds, lovely soil tones, a touch of leesiness, a touch of spring flowers and a very judicious framing of vanillin oak. On the palate the wine is pure, full-bodied and still fairly tightly-knit, with a fine core, lovely focus and grip and superb backend energy on the long and zesty finish. This is still very early days for this very promising chardonnay, and I would not be tempted to open a bottle for at least another two or three years, as it is still very primary in profile and needs some time to allow the secondary layers of complexity to begin to emerge. 2017-2030+.92+. The 2013 Alpine Vineyard chardonnay is another beautiful, young wine from this great vintage at Rhys, and in the fullness of time, this may well take its place at the top of the hierarchy of all the chardonnays yet produced at this Santa Cruz Mountain icon. The bouquet is deep, pure and still quite youthful, as it wafts from the glass in a classy blend of pear, passion fruit, a touch of hazelnut, complex soil tones, a hint of iodine and a topnote of vanillin oak. On the palate the wine is pure, full-bodied, complex and impeccably balanced, with a fine core, great focus and grip, bright acids and outstanding length and grip on the very Meursault-like finish. This is showing more of its latent complexity out of the blocks than the Horseshoe bottling, but it too is a very young wine and it would be fool-hardy to be opening bottles in the next few years, as there is so much more complexity to come with bottle age here! Great juice. 2018-2030+.94+. 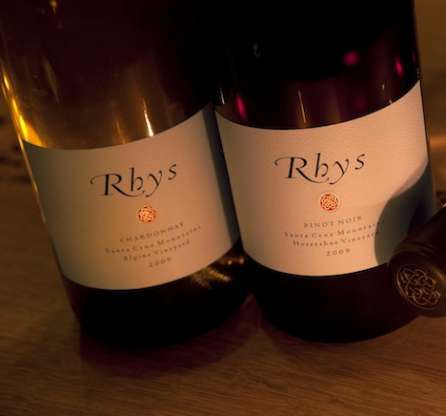 Rhys Vineyards in less than a decade has come to define great, traditionally styled pinot noir and their Alesia label, for the wines they make from purchased grapes, is often one of the top values to be found for this varietal in California. The 2013 Alder Springs Vineyard bottling is quite a bit riper this year than the cool and classy 12.5 percent alcohol of the 2012 version, as this wine tips the scales at a pretty generous 13.6 percent. The wine is a bit jammier in personality as a result, but still deep and complex on the nose, offering up scents of baked cherries and plums, a touch of beetroot, chocolate, fresh herb tones, a nice signature of soil and a deft framing of smoky new wood. On the palate the wine is deep, full-bodied and velvety, with a good core, bright acids and a bit of backend heat on the complex and wide open finish. This is far more accessible out of the blocks than the more structured and cooler 2012, and will supply plenty of enjoyment over the coming decade, but at 13.6 percent, it seems a bit riper than would be ideal for longer-term cellaring. This is good, solid juice, with plenty of complexity, but I would have loved to have seen it a bit lower in octane. 2015-2025. 88. The San Mateo bottling is typically from a section of the Family Farm Vineyard that is not quite as consistently excellent as the lion’s share of the vineyard, often with small lots of other vineyards added to the blend. In 2013, this is eighty-five percent Family Farm fruit from the recalcitrant portion of the vineyard, along with a bit of younger vine juice from Alpine and Horseshoe Vineyards. The wine is very pretty and stylish, albeit in a bit more fruit-driven style than a typical Rhys pinot noir and suggests a bit of younger vine fruit in the blend. However, the 2013 San Mateo bottling is nicely cool, coming in at a very suave 12.9 percent octane and offering up a complex aromatic blend of cherries, beetroot, gentle notes of woodsmoke, coffee, herb tones and a lovely topnote of roses. On the palate the wine is pure, fullish and silky, with a fine core of fruit, lovely and quite elegant fruit tones, modest tannins and a long, tangy and beautifully balanced finish. This is really a lovely bottle in the 2013 vintage, with plenty of fruit complexity and a very seamless style. 2015-2030+. 90. The 2013 Home Vineyard pinot noir shares an intensity of flavor and backend energy this year with all of the other fine pinots in the lineup, and it is quite clear that the 2013 vintage here at Rhys is a very special year indeed for this variety (and we shall see about the syrahs from this vintage next year, when they are ready for release). The bouquet on the Home Vineyard is deep, pure and black fruity, delivering a complex constellation of black plums, black cherries, cola, beautifully complex soil tones, a dollop of fresh herbs, a discreet framing of cedar and esthery savory notes in the upper register. On the palate the wine is pure, full-bodied and tangy, with superb mid-palate depth, fine-grained tannins, sound acids and lovely length and grip on the complex and still pretty primary finish. This is a touch more bound up in its fine structure out of the blocks than some of the single vineyard bottlings, but this will just protect it from infanticide and the wine will be stellar when it blossoms fully. 2020-2050.93+. The 2013 iteration of Family Farm pinot noir from Rhys Vineyards is an utterly suave and classy bottle of young pinot, with a black fruity personality, tons of soil signature and outstanding structural integrity that will carry it far into the future. The simply gorgeous bouquet jumps from the glass in a complex blend of sweet dark berries, woodsmoke, espresso, stony soil tones, sarsaparilla, fine herbs and a gentle touch of new wood. On the palate the wine is pure, full-bodied and very soil-driven in personality, with a great core of fruit, superb focus and grip, fine-grained tannins and stunning length and grip on the nascently complex finish. This is going to age magically, and though it will be approachable upon release, please leave it alone in the cellar for at least the next five years (perhaps after dipping into a single bottle just to see where it is going!) and allow it to fully blossom. Its apogee of peak drinkability will probably be ten to twelve years down the road. 2020-2050. 94+. The Bearwallow bottling of pinot noir has always stood out a bit from the Rhys San Mateo and Santa Cruz bottlings, but it has company from Mendocino in 2013 with the new Porcupine Hill cuvée in the lineup. The 2013 Bearwallow tips the scales at an even thirteen percent and offers up a beautifully complex bouquet of pomegranate, black plum, a touch of coffee bean, fresh herb tones, a fine base of dark soil and incipient notes of cola in the upper register. On the palate the wine is deep, full-bodied and rock solid core of very sappy fruit, with tangy acids, impeccable balance, ripe tannins and excellent length and grip on the focused and youthfully complex finish. There is a great sense of reserve and backend energy in this wine in 2013 that augurs extremely well for its future evolution in bottle. This is the first vintage where some new, high density plantings have been included in the bottling and, there is no question that this is the finest vintage of Bearwallow pinot noir that I have yet tasted from Rhys! 2021-2050+.95. The 2013 Porcupine Hill pinot noir from Kevin Harvey and his talented team at Rhys comes in at a very civilized 12.7 percent octane in this vintage. This is a new, high density planting of vines in the Bearwallow Vineyard, that are on a hillside section that was not previously cultivated and are planted to a density of 17,000 vines per hectare! The wine offers up beautiful nascent complexity on both the nose and palate, wafting from the glass in a classy aromatic constellation of red and black cherries, woodsmoke, French roast, a touch of chicory, beautiful dark soil tones, a hint of cedar and a gentle topnote of mustard seed. On the palate the wine is pure, full-bodied and light on its feet, with outstanding intensity of flavor, moderate, fine-grained tannins, lovely acids and superb length and grip on the poised and still fairly primary finish. This will be all too easy to drink out of the blocks, but there is no doubt that a bit of self-restraint will be very well-rewarded four or five years down the road, as this wine has layers of complexity still to unfold with time! As this is still quite young vines, I am sure that we are only seeing the tip of the iceberg here and the Porcupine Hill bottling is going to get better and better as these vines get older. 2019-2050. 93+. The 2013 Santa Cruz Mountains bottling of pinot noir from Rhys Vineyards is a lovely, red fruity wine that tips the scales at a very civilized thirteen percent alcohol. The wine offers up a beautiful and very red fruity aromatic blend of strawberries, cherries, eucalyptus, coffee, a nice touch of soil and a pretty topnote of sweet herbs. On the palate the wine is fullish, suave and quite velvety on the attack, with a fine core, modest tannins and a long, tangy and beautifully balanced finish. A really lovely entry level bottling from this superb Santa Cruz Mountain estate. 2015-2025+. 90. The 2013 Horseshoe Vineyard pinot noir from Kevin Harvey and his fine team at Rhys is a very, very civilized 12.5 percent octane and offers up a gorgeous bouquet of sweet dark berries, black cherries, stony minerality, fresh thyme, raw cocoa, cardamom, cloves and a very discreet base of spicy oak. On the palate the wine is pure, full-bodied and tightly-knit, with a fine core, tangy acids, a nice signature of stems from its inclusion of plenty of whole clusters, moderate, ripe tannins and a very long, transparent and intensely flavored finish. This is still a puppy, but it is clearly one of the finest vintages of pinot noir I have yet tasted from the Horseshoe Vineyard. It will demand some cellaring to fully blossom on the palate, but the stunning aromatics show just how fabulous this wine will be at once it has blossomed. 2020-2050. 93+. The 2013 Skyline Vineyard pinot noir is as expressive and exotic on the nose as I can remember for a young wine from this great terroir, and I suspect that the 2013 is going to be a reference point vintage for this wine that we are going to look back on with reverence a decade or two down the road. The stunning nose wafts from the glass in an magically complex blend of black plums, pomegranate, a touch of smoked duck, gorgeously layered soil tones, a bit of balsam bough, cola, woodsmoke, sweet herbs and a touch of new wood. On the palate the wine is pure, full-bodied and already quite velvety in texture, with laser-like focus, a sappy core, moderate tannins and a very long, very complex and tangy finish. This beautiful wine is only 12.6 percent alcohol, but is so layered and intensely flavored that it could not be improved upon by any means- other than magnums! A great, great young pinot noir that is deceivingly approachable today and is going to be hard to resist young, but which will age brilliantly. 2019-2050. 96+. The 2013 Alpine Vineyard bottling this year from Rhys is another truly exceptional example of the vintage and this wine is a cellar treasure in the making. Like many of the other 2013 pinots here, there is a musky sappiness on the nose that is truly stunning (and has not really been seen here in previous vintages), with the wine delivering a gorgeous aromatic constellation of sweet dark berries, black cherries, espresso, complex, dark soil tones, fresh thyme, exotic spice tones and a deft framing of cedar. On the palate the wine is pure, full-bodied and sappy at the core, with great structure, fine-grained tannins, bright acids and outstanding length and grip on the pure and nascently complex finish. A great, great wine in the making, and a bit easier to resist out of the blocks than the 2013 Skyline, which will make it far less likely to be slaughtered by premature opening! 2021-2050. 95+. As I noted last year, the Swan Terrace bottling hails from an easterly-facing section of Alpine Vineyard that merits a bottling on its own for its own unique voice of terroir. The 2013 version is a marvelously elegant and complex wine on both the nose and palate, offering up a cool fruit mélange of dark berries, bing cherries, beautiful botanicals, a touch of gamebird, lovely minerality, vinesmoke and a gentle topnote of cardamom. On the palate the wine is medium-full, tangy and very intensely flavored, with a fine core, moderate tannins and great transparency on the very long, youthful and oh, so promising finish. This is the lowest octane bottling of pinot noir from the Rhys lineup in 2013, coming in at a svelte 12.2 percent alcohol, but there is no shortage of stuffing or intensity and all this lovely wine needs is time in the cellar to fully blossom. 2020-2050. 94+. The very first release of the “Horseshoe Hillside” reserve bottling of pinot noir from Rhys Vineyards is utterly spectacular, with a more reserved personality than the regular bottling and even more precision and complexity. The great nose wafts from the glass in a bottomless mélange of sweet dark berries, a touch of grilled meats, bitter chocolate, a superbly complex base of soil tones, sweet herb tones, vinesmoke, an exotic touch of dried eucalyptus and a discreet framing of spicy oak. On the palate the wine is deep, full-bodied, pure and impeccably balanced, with a great core, stunning soil signature, suave tannins, good acids and outstanding length and grip on the long, nicely reserved and complex finish. There is a nice touch of youthful stems here that is not evident in the regular Horseshoe Vineyard bottling, but this wine is supposed to include the same percentage of whole clusters as the regular, and I imagine that this is just how the wine is showing at this early stage in its evolution. This is going to be an absolutely brilliant bottle of pinot noir with sufficient bottle age, but give it at least five or six years in the cellar to start to blossom before even considering opening a bottle! Not that it will not be delicious out of the blocks, but this is so clearly built for the long haul that it would be insanity to waste bottles early on! 2021-2050+. 98+. Unlike the Horseshoe Hillside, the Alpine Hillside bottling does include just a touch more whole clusters than the “regular” Alpine cuvée, but otherwise the wine has been treated exactly the same in the cellars prior to bottling. The bouquet is pure, complex and absolutely stunning in its youthful magnificence, offering up notes of black cherries, black plums, a stunning base of minerality, a potpourri of botanicals, a touch of gamebird, graphite, incipient notes of the autumnal elements to come, a touch of youthful stems and a refined framing of new wood. On the palate the wine is pure, full-bodied and light on its feet, with a sappy core, great transparency, moderate, beautifully integrated tannins and a long, tangy and still fairly youthful finish. This is more accessible out of the blocks than the Horseshoe Hillside, but it too is really built for the long haul and it would be criminal to commit infanticide with any bottles of this rare and utterly brilliant young wine! 2021-2050+. 99. The 2012 Rhys syrah from the Horseshoe Vineyard is a bit less ripe in personality than the 2012 Skyline Vineyard version (please see below), coming in at an even thirteen percent octane and offering up simply stunning aromatic and flavor purity. The very complex bouquet smells like a Gérard Chave wine from the 1980s, soaring from the glass in a precise and classy constellation of cassis, black raspberries, roasted meats, raw cocoa, black olive, stony soil tones, a touch of medicinal young syrah, new leather, cedar and just a whisper of lavender in the upper register. On the palate the wine is deep, full-bodied, complex and brilliantly soil-driven, with a fine core, flawless focus and balance, ripe, chewy tannins and a very long, very complex and soil-driven finish. This is a puppy and will need at least eight to ten years to really come into its own, but it should prove to be a serious long-distance runner and a reference point example of just what is possible with this grape in a properly stony terroir, coupled with impeccable winemaking. Stunning young syrah! 2023-2060+. 95+. The 2012 Skyline Vineyard bottling of syrah from Rhys Vineyards is pretty ripe by the standards of this cuvée, coming in at 13.7 percent alcohol, but the wine is still impeccably balanced and shows outstanding potential for the cellar. The deep and youthful nose wafts from the glass in a fine blend of cassis, black pepper, espresso, stony soil tones, black olive and cigar ash. On the palate the wine is deep, full-bodied, ripe and still impressively transparent, with a fine core, tangy acids and superb complexity and grip on the long and ripely tannic finish. This will start to drink well four or five years down the road and probably reach its apogee around its tenth birthday. Lovely juice. 2019-2050. 93.